Presentation folders are one of the best ways to organize your marketing materials when presenting them to a client. There are many uses for presentation folders, such as introducing your business or company to a new client, or to package your promotional materials as an information pack. Although it may be tempting to go for a simple design for your presentation folders, it is important to consider that if you are planning to use it for marketing purposes that it matches your branding. We have a team of designers that can work closely with you to help you achieve the perfect design. 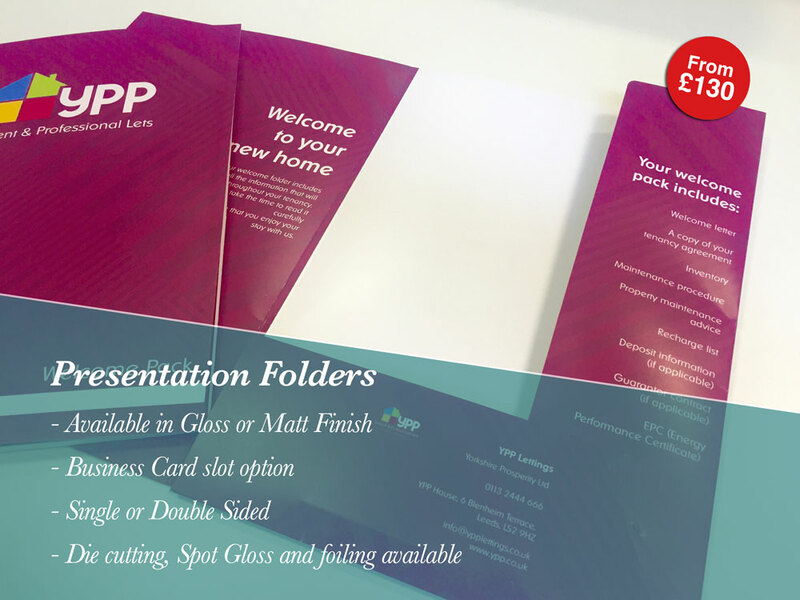 At Leeds printing company we want to make sure your presentation folders are right for you. We offer A4 and A5 size presentation folders with an optional slot for a business card. We can produce your single or double-sided presentation folder using a sturdy 400GSM stock, which can be finished with silk lamination or gloss. Die-cutting is also available. Prices below for presentation folders printed on 400gsm Silk or Gloss with Business Card Slot. Price includes VAT. Prices above are for presentation folders printed on 400gsm Silk or Gloss. Standard delivery time is 3-4 working days. Orders need to be placed by 16.30 complete with print-ready artwork. Price includes VAT. What size Presentation Folders do you offer? We offer presentation folders which are A4 or A5. What Stocks do you print Presentation folders on? Our standard stock for presentation folders is 400gsm Silk. Other stocks maybe available – please get in touch to find out more. Do the presentation folders come with a slot for a Business Card? Yes, all our presentation folders come with a slot. You can also request presentation folders without a slot. Can you provide Spot Gloss, Die Cut and Foiling?